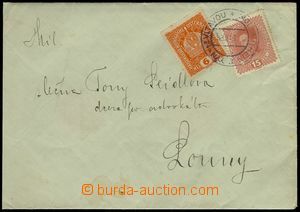 1918 commercial letter sent in/at postal rate I as priority printed matter in the place, 2x 3h after/behind každých 50g + supplement for priority delivery 2h, franked with Austrian stmp Mi.220A, 185 with overprint "T", nationalized CDS BRNO 4/ 30/11 18; vertical fold, on reverse hints after sticking, rare franking! 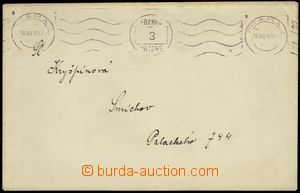 1918 card sent as printed matter, franked with Austrian stmp 3h Crown, Mi.185, MC TROPPAU/ 18.XI.18; good condition, decorative! 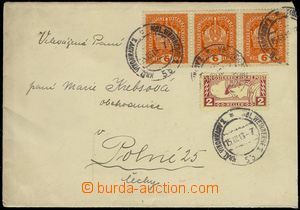 1919 letter sent as printed matter přednostně(! ), franked with. Austrian express stamp. 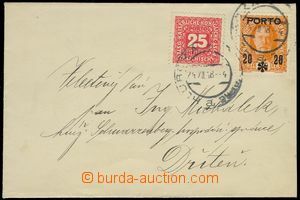 5h, Mi.220A, postage 3h + 2h express - priority sending, CDS GABLONZ a.d. NIESSE 1/ 9.I.19; good condition, rare franking! Pof.2Cvz-26Cvz, overprint VZOREC, line perforation 13¾;, selection of 24 pcs of perforated bloks of four, very good condition, cat. 82.000CZK, quite rare in blocks of four!